You might call this cheating, but this review ran already. It originally ran as part of my Halloween films, so if you missed it the first time here it is. I can’t be any happier that the package films are done. None of them were particularly great, and it seemed that the animators were limping into home towards the end. The issue with this film, more than anything else, is the confused tone of the stories. 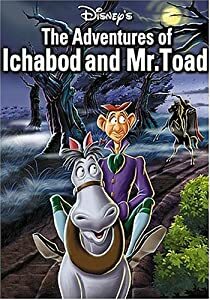 There’s a tenuous connection between Mr. Toad and Ichabod Crane. Both main characters are “prone to disaster” and thus were perfect to pair together according to the Disney animators. I find that to be a weak effort because one section is light and the other is exceedingly dark. Issues such as misplaced songs and just a lack of character connection make me wonder about the rest of the short films. The film starts off by presenting a truncated version of Kenneth Grahame‘s The Wind in the Willows by following the manic whims of Mr. Toad (voiced by Eric Blore). Toad gets “motor mania” and in his bid to drive a motor car ends up on a path of petty crime and prison. The second short is a retelling of Washington Irving’s The Legend of Sleepy Hollow. Narrated by Bing Crosby the short follows mild-mannered teacher Ichabod Crane as he tries to woo Katrina Van Tassel and has a fateful meeting with the Headless Horseman. It’s pretty obvious why I included this film on the list, for the Sleepy Hollow tale. First, a little back story which I’ll try not to repeat when I start covering the package films properly during Journeys in the Disney Vault. The Adventures of Ichabod and Mr. Toad was the last Disney package film produced before the studio returned to feature-length animated efforts (with Cinderella in 1950). Starting with Saludos Amigos in 1942, Disney had been losing money over several films and due to the outbreak of WWII lost several animators to the war effort. Instead of putting out no product at all Disney decided to create a series of shorts and cobble them into films, thus presenting a package of different stories. In just watching this one I can’t say I enjoy this technique as it simply feels like your watching two cartoons as opposed to one cohesive film. Aside from placing live-action footage of a library before and after each story there’s no unifying device to link these movies. The connection to why these two stories are placed together is lazy and you never connect with the characters, particularly in the story of Ichabod because there’s no dialogue from the characters but narration (Basil Rathbone narrates Mr. Toad while Bing Crosby narrates Ichabod). Because these two stories are so different that leads to an inability to create a collective storytelling device. The film opens with a sprightly jingle about Ichabod and Mr. Toad. It led me to believe these two characters were going on a road trip or something because it’s just so happy! From there your placed in a live-action library with each narrator pulling out a book to read. There’s an implied rivalry between the US and UK with Bing Crosby narrating Ichabod’s tale and Basil Rathbone narrating Toad. I liked the distinct narrators but I was unsure why Mr. Toad has actual voice actors for the animal characters and in Ichabod, the only person who actually sings/talks is Brom Bones leaving the rest to be narration. We’ll start with Mr. Toad’s story first. I have never read The Wind in the Willows (blasphemy I know) but I do love the ride at Disneyland. With that being said I didn’t particularly enjoy this story. For some reason I found myself zoning out over the dull antics of Toad that seem to start and stop with the abruptness of the motor car he covets. We’re quickly introduced to the characters only to have Toad become obsessed with a motor car, go on trial, and go to prison. I did enjoy the staunch English actors who lend their voices to the animal characters. In fact there’s a quaint, English sensibility that permeates this film casting a dour pallor over things like why does Cyril the horse start speaking in rhyme? I did enjoy the lengths it went to but it does make things boring at times. Not to mention this film is a tad dark. I mean those weasels have guns with bayonets on them! Overall I wasn’t a fan of this short although I know a lot of others love it. I love the story of Sleepy Hollow! Hell, I love Tim Burton‘s take on it! And for about five minutes I enjoyed Disney’s take on it. The issue, as stated already, is Disney’s desperate need to make this happy despite the dark overarching theme. We’re introduced to Ichabod Crane through song. Yes, for some reason this short has songs! And if you actually listen to the lyrics of “Ichabod Crane” they’re rather mean-spirited: “Who’s that comin’ down the street/Are they shovels or are they feet?” Ichabod is an opportunist and apparent womanizer. He’s nice to the students “whose mothers were good cooks.” The arrival of Katrina Van Tassel gives the story momentum, about as much as Katrina’s heaving bosom! I mean seriously the girl’s chest is gigantic for a Disney character in the 1940s or any character other than Jessica Rabbit. It doesn’t help that Katrina looks like Cinderella too. We’re never sure if Ichabod loves Katrina or purely her money. In one scene he’s fantasizing about her while cutting to what she owns. In one breath he’s proclaiming his love then stating he hopes her father dies soon! For some reason the scriptwriter want you to believe Ichabod Crane is a man of sexual magnetism and I never understood why. We have the big party scene at the Van Tassels which has some fun slapstick and then the film rushes headlong (pun intended) into the Headless Horseman story. The song “The Headless Horseman” is the only song I truly loved. It’s just fun and spooky enough to set the tone that should have been throughout this entire short. It’s a hint of what this could have been. Of course Ichabod has his fateful meeting with the Horseman and…that’s it. The film tries to say that whilst Ichabod was never seen again there were rumors of him living and don’t forget that Katrina married Brom! You can’t really say a character’s gone, probably dead, and cut to a “happily ever after” for other characters. If Disney wanted to go dark it needed a longer runtime and a stronger ability to blend the whimsy with the macabre. As I’ve stated before The Adventures of Ichabod and Mr. Toad is very confused about how to handle the subject material. I understand now why this film is generally released separated, with individual discs for each, because they don’t belong together. I will give the advantage to Ichabod because the Sleepy Hollow story is so fun but the story loses focus on trying to be light with songs and Ichabod being a ladies man. By the time the Horseman shows up the film doesn’t have any time left and just slaps on a happy ending. Mr. Toad is okay but there’s little connection to the story or the characters. Since I’ll be watching the rest of Disney’s package films eventually I hope I find one better than this. NEXT WEEK: Disney returns to feature-length films with the 1950 fairy tale Cinderella! My initial experience with Ichabod was as part of a Disney Halloween special (which also included Night on Bald Mountain from Fantasia along with other appropriate spooky content) so maybe in that more coherent collection it plays a bit better. In watching this particular pairing, I did wonder if Ichabod was shortened in the version I watched because it lacked the same intensity that I remembered. If I had to come with a theme, it is morality tales about irresponsibility or something, with Mr. Toad basically being a Paris Hilton layabout and Ichabod being a womanizer. It’s just kind of strange for Disney. I do worry that you are in for a rough patch here with the short collections; hope you can keep up the energy to keep going on the other side. I remember that same Halloween special! In fact I eventually tracked down a DVD copy of it that is awesome to watch on Halloween and your right, I think that did color my thoughts on this. I do agree the morality angle could be there although I don’t see it explained fully in such a short time if that was the intent. Haha, thankfully these package films are pretty short from the looks of it so hopefully I can barrel through! I love the story of Sleepy Hollow, both Tim Burton’s version and this one with Bing. To be honest, I never watched the Mr. Toad part. I agree that Ichabod is a bit of a quirky character, but I like him none the less. I like the songs, ESPECIALLY with Bing Crosby! Haha glad to know I wasn’t the only one who doesn’t like Toad although you did better by avoiding it lol. Sadly I don’t get the whole Bing Crosby thing. I’ve seen a few of his movies and I’m just not a fan. This one always freaked me out as a kid for some reason. I don’t even really remember why now…Doesn’t sound like it’s worth revisiting to find out, either. I remember the end of the Sleepy Hollow segment more than anything else and I think that’s because Disney marketed the ending better than the rest of hte movie.